The River Findhorn supplies an abundance of food to the Bay, evidenced by seals and seagulls feeding at the line between the peaty river waters, and the clear saltwater of the Moray Firth. It is renowned as a fabulous river to fish, by many expert flyfishers staking their skills against the salmon swimming upstream. 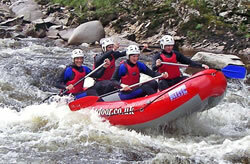 One other sport that seems to be increasingly popular is kayaking or white water rafting in the upper and middle stretches of the Findhorn. The river is graded from Category II to IV, and sports many gullies and rocks to negotiate on your downstream trip. A couple of local operators are G2 Outdoor, and Full On Adventure. We haven’t yet used or experienced either of these operators, so are unable to recommend them personally. However a call to Tourist Information at Aviemore will likely yield a recommendation. Have fun! You’ll be glad of that whisky in front of the roaring fire at The Kimberly on your return to Findhorn.